Vintage Warehouse 65 Classic Car Seat Belt System. 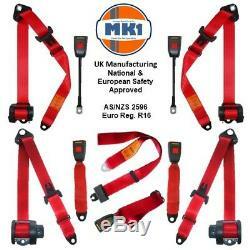 A full set of five aftermarket classic style 3 Point Fully Automatic Inertia Seat Belts and Lapbelt kit in Red, perfect for your Vw if you belts are past theor best and you are looking to upgrade. The Pair of Front 3 Point Automatic belts come with a 290cm webbing length and come with a 30cm flexy cable buckle stalk The Pair of Rear 3 Point Automatic belts have a 265cm webbing length and come with a 32cm webbed buckle The Single Rear lapbelt has an adjustable 120cm webbing length and comes with webbed buckle that adjusts up to 46cm. All my Seatbelts come with International, European & National Standards ISO 9001: 2008 Quality management System World wide coverage Inc Australia, Are made in the United Kingdom and have been protecting life since 1973. Please note these items are non-electrical will not replace a seatbelt with an airbag pre-tensioner unit and will not turn off a dash light but may be used in place of a system once it has been de-activated for MOT purposes. The item "Volkswagen Golf Mk2 Gti 8v 16v Full Set Front & Rear Red Automatic Seat Belt Kit" is in sale since Wednesday, March 21, 2018. This item is in the category "Vehicle Parts & Accessories\Car Parts\Interior Parts & Furnishings\Seat Belts & Assemblies". The seller is "mk1classiccarparts" and is located in Bromsgrove, Worcestershire. This item can be shipped to North, South, or Latin America, all countries in Europe, all countries in continental Asia, Australia, New Zealand.